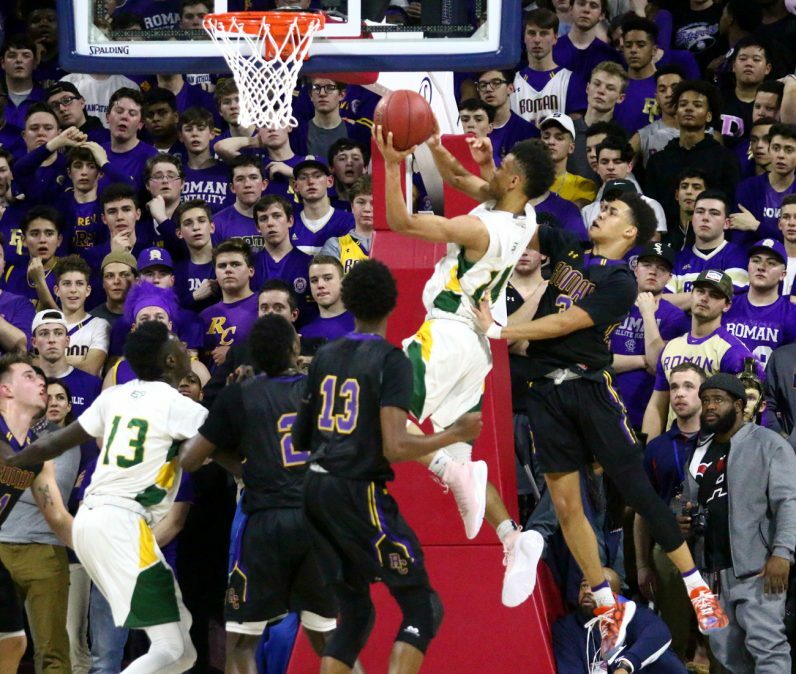 A few seconds after Roman Catholic sophomore Lynn Greer III and junior Hakim Hart teamed up for a legendary basket in Monday night’s Catholic League basketball championship at the sold-out Palestra, CatholicPhilly.com editor Matt Gambino borrowed a term from the local sports lexicon made famous after the Philadelphia Eagles won the Super Bowl three weeks ago. 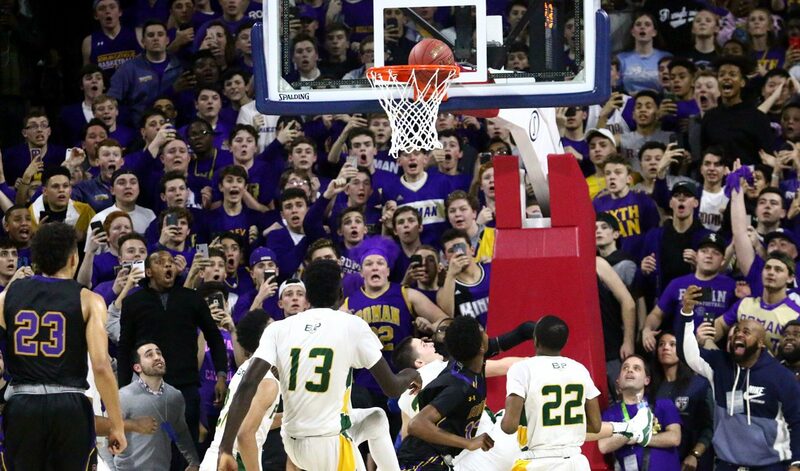 Minutes earlier, Hart’s basket with 1.6 seconds remaining in regulation catapulted Roman Catholic to a dramatic 51-49 triumph over Bonner-Prendergast. The Cahillites have now seized three of the past four CL titles and a league-record 31 altogether. This one certainly placed itself in the annals of most exciting. During a back-and-forth affair that featured eight deadlocks and nine lead changes, the third-seed Cahillites (19-5 overall, including a 68-66 overtime loss to B-P on Jan. 19) tied the game at 49-49 and had possession with about one minute left. Second-year coach Matt Griffin implored his troops to hold for the last shot. With Greer doing most of the dribbling at the point while being hounded by B-P junior and league Most Valuable Player Isaiah Wong (18 points, nine rebounds, four blocks), Roman made its move as the mesmerized Palestra crowd emitted a nervous buzz. Greer drove inside, had nowhere to shoot, and then found an open Hart darting under the basket. Despite contact by a B-P defender, the 6-foot, 5-inch swingman banked in a layup that sent Roman’s nearby fan-base in total hysteria. After a timeout, the top-seed Friars (21-4) were unable to set up a final attempt, and a game that “featured” 28 combined turnovers — that’s more than one every two minutes — was over. Roman coach Matt Griffin said the Cahillites have practiced for these situations all season long. “It’s all about grinding,” said Griffin. “We didn’t want to win pretty. It’s about winning ugly and about scoring more points than Bonner. We knew it was going to be a one, two, or three-point game. We’re grateful to come out on top. Junior Seth Lundy (five rebounds) led the Cahillites in offense with 15 points. Senior Allen Betrand (five rebounds, three steals) added 14 points while Greer netted 12. But it was Greer’s fifth assist and Hart’s fifth and sixth points that provided the difference. Asked if he had ever before scored a game-winner, Hart said he had done so in middle school. He was asked if this one was a bit more important.